As we're saying farewell to June, I'm preparing for the new endeavors that July has planned for us. Usually during this time of the month, the kids and I are packing our things and looking forward to our yearly Summers in California with my side of the family. But this year will be a little different. My mom will finally be starting a new life here with us in Houston and we couldn't be more excited for her arrival. I've been here in Houston without family for years and built this independence over time, running on my own schedule. So there will definitely be some adjusting to get use to, but it'll be nice to have someone to share my morning coffee with, to laugh and confide in, and to help me with the daily life of mommyhood. My hope is that she finds her happiness, and I'm determined to help her find what she so much deserves. We're still planning a couple of mini-vacation trips to show her around Texas, so I can shower her with some southern goodness! 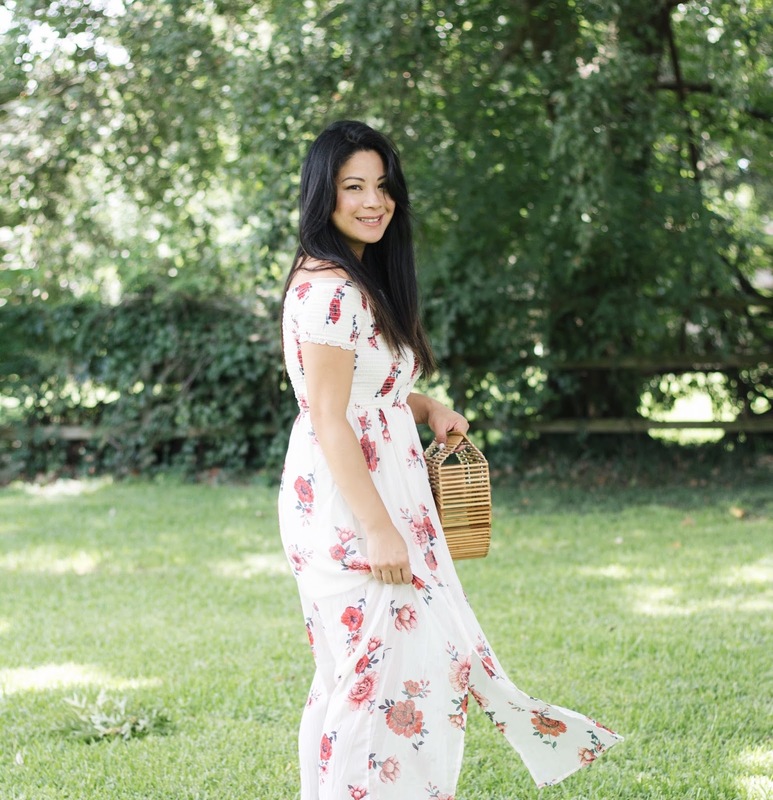 One of the things I've been looking for this month has been flowy maxi dresses. They're really one of my favorite things to wear because you can feel the most comfortable, while looking romantic at the same time. 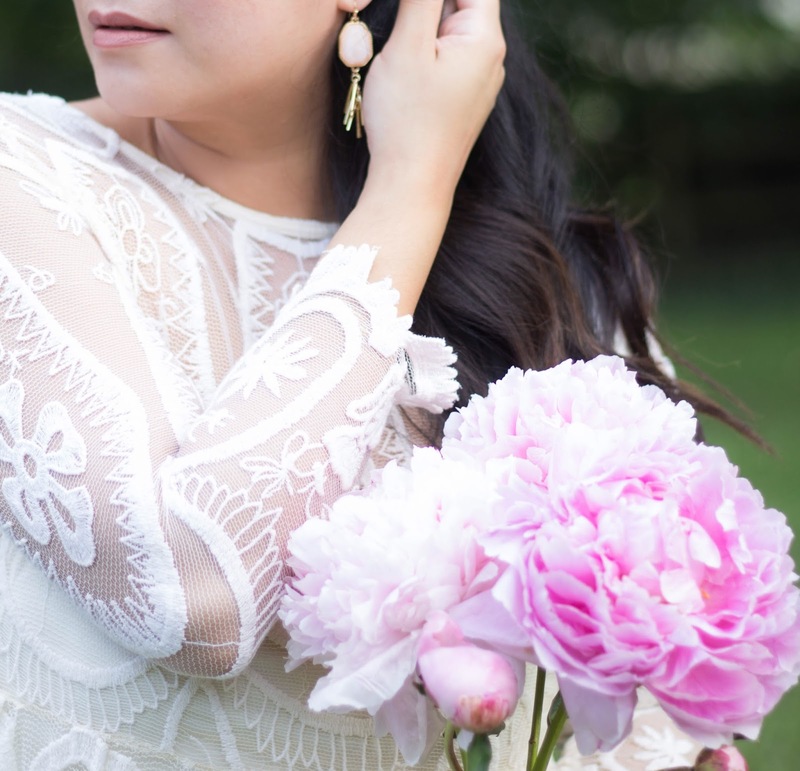 I also love a good bardot dress, that shows off your shoulders and a beautiful neckline. I was really drawn to the gorgeous pattern and colors of this recent find from Marshall's and couldn't wait to share it with you. It actually reminded me a lot of this floral dress I've been wanting to buy from ASOS, but couldn't work in into the budget yet. So, needless to say, it was a great feeling to find a similar style at a more affordable price. The movement of this dress is so dreamy too and I can see it being one of the looks I take to an upcoming trip to the beach! 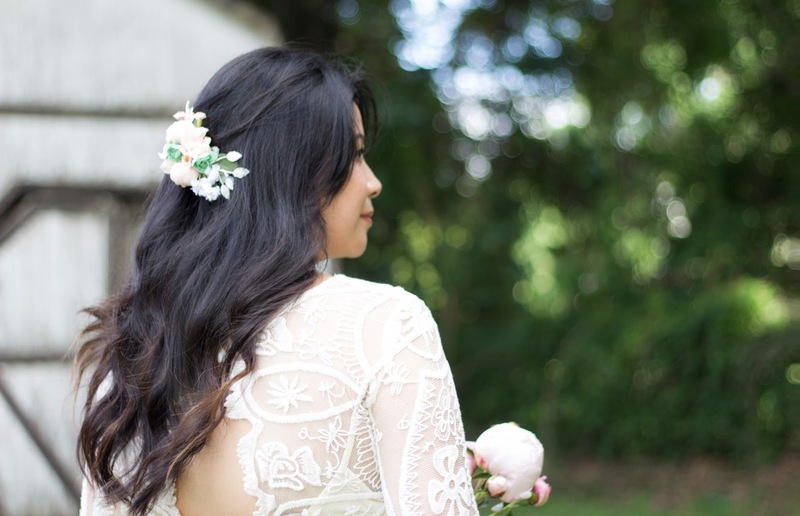 It looks perfect with all my natural & woven bags, and I couldn't have asked for a better dress. Bohemian goddess, here I come! For the Summer season I really like going for a minimal & effortless look for everyday. It's all about a natural and dewy complexion where my freckles peek through and my skin feels healthy & bright. 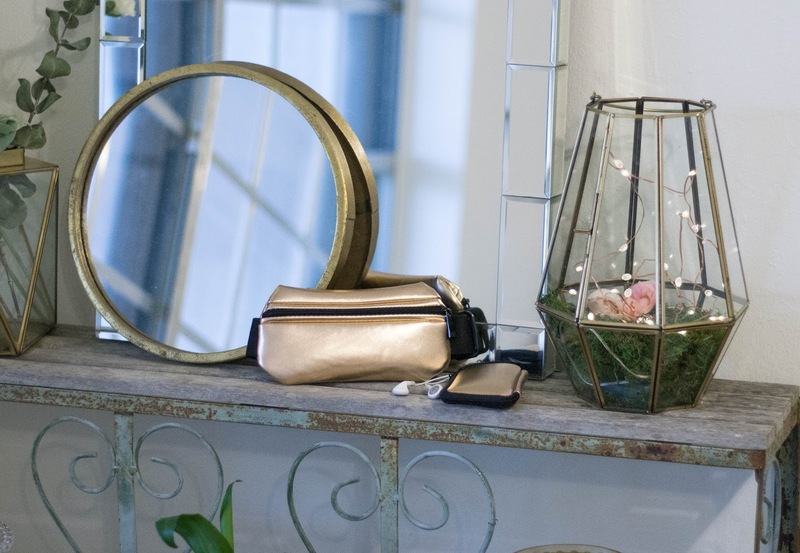 I've tucked away most of my powder products and filled my makeup vanity with hydrating and cream goodies to help create a flawless glow. 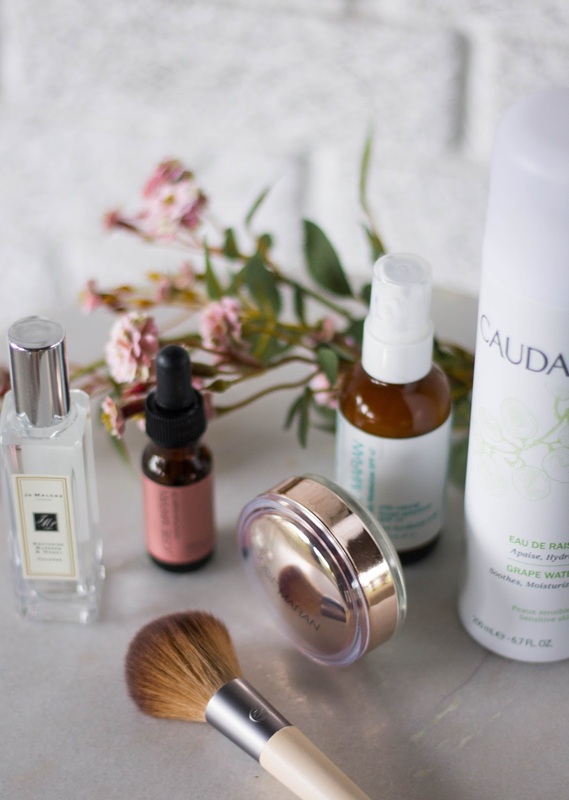 Below is my current Summer makeup routine and I'm smitten with each and every product, especially since most are organic. So why wait any further ... let's get started for the day! 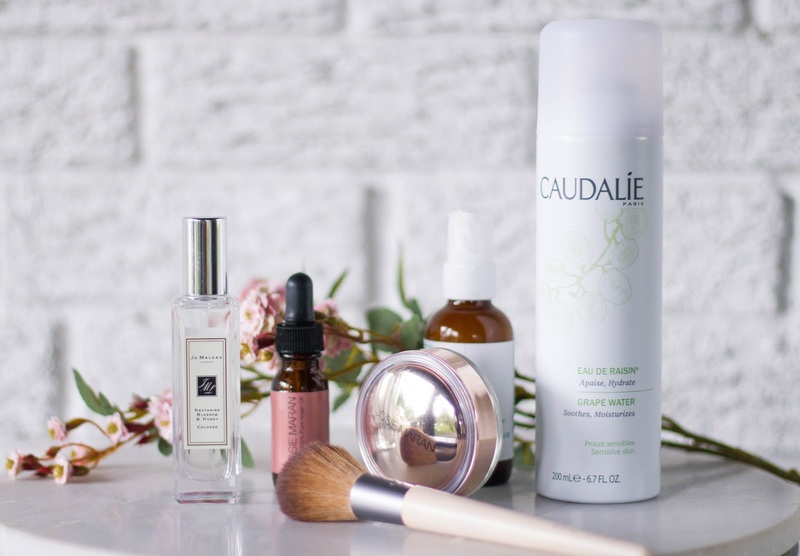 Caudalie Grape Water: A step I look forward to everyday and never miss, is a generous mist of grape water. It feels amazing and cooling on the skin, and provides a boost of hydration that helps during the Summer months. It's the first step of my skincare routine and it also reduces any redness, almost instantly. It's a great overall product to use throughout the day, even for a mid-day pick me up. Josie Maran 100% Argan Oil: As a lover and long time fan of Josie Maran skincare/makeup, Argan Oil is something that's been a staple in my regimen for years! Rich in Vitamin E and antioxidants, it's an organic way to promote youthful skin, by reducing wrinkles and aging. I love how this simple ingredient provides just the right amount of hydration to my face and under eye area without making me look oily throughout the day. I can't live without this stuff! Josie Maran Daily Moisturizer with SPF: Another favorite and necessity for the Summer is this chemical-free SPF and light moisturizer. This two in one product adds a soft focus dewy finish that preps the skin beautifully before applying a tinted moisturizer or foundation. My skin is more dry/normal at the moment, which is why I use argan oil before hand, but this is definitely good enough as a daily moisturizer/SPF combo. Sometimes I skip makeup altogether, especially when I go to the gym, and wear this alone with concealer. Josie Maran Surreal Finishing Balm: Now, this is a product I couldn't wait to chat about! This finishing balm is one of the best primer's I have ever used and let me tell you why! Marketed initially as a finishing balm to set your makeup, I've found this works wonders as a face and under eye primer. It's a creamy pearlescent formula that smooths fine lines and diminishes the look of pores to create a smooth canvas for applying foundation. I only apply it to the area's I need help with, like my cheeks, nose, chin, and a tiny dab to the under eye area. Paired with Tarte's Maracuja Creaseless Concealer, it's a combo that stays put the entire day without any creasing. It's a fantastic product that I highly recommend! 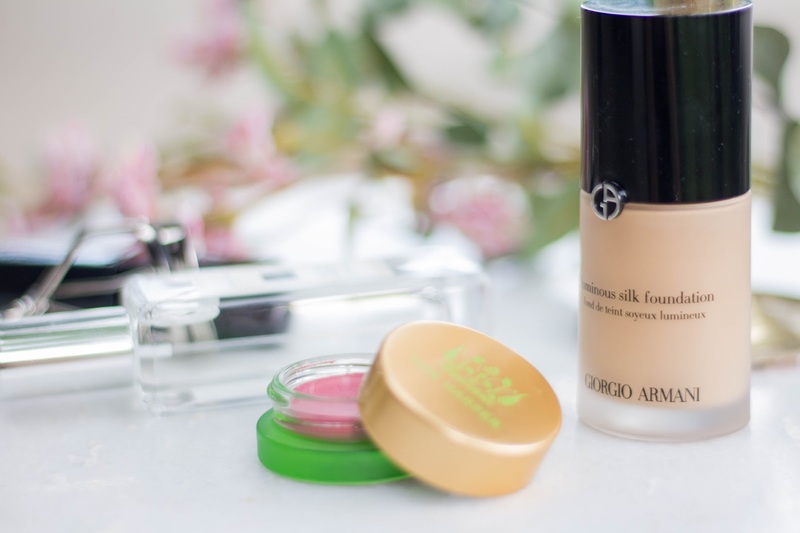 One pump of Giorgio Armani's Luminous Silk Foundation in 5.75 with my beauty sponge by EcoTools, and my base is set for the day. 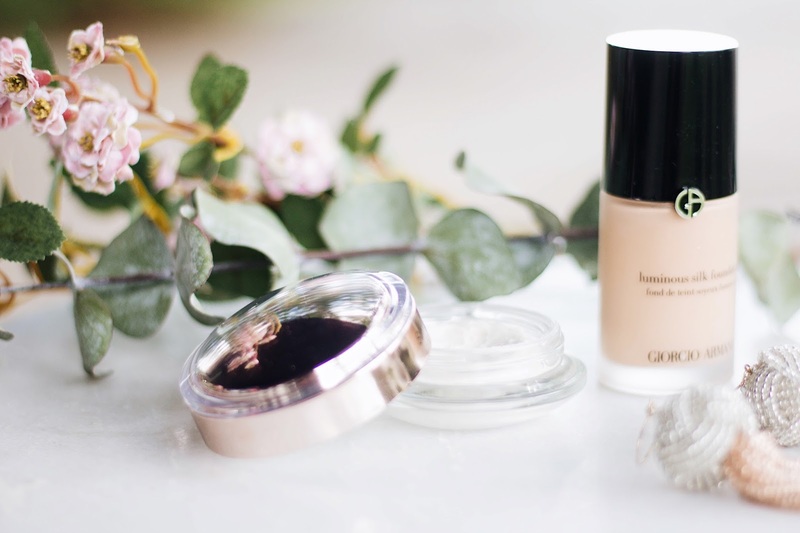 As a helpful tip, apply a sheer layer first of your makeup products (especially foundation) and build from there. This is the key to getting a your skin but better look. 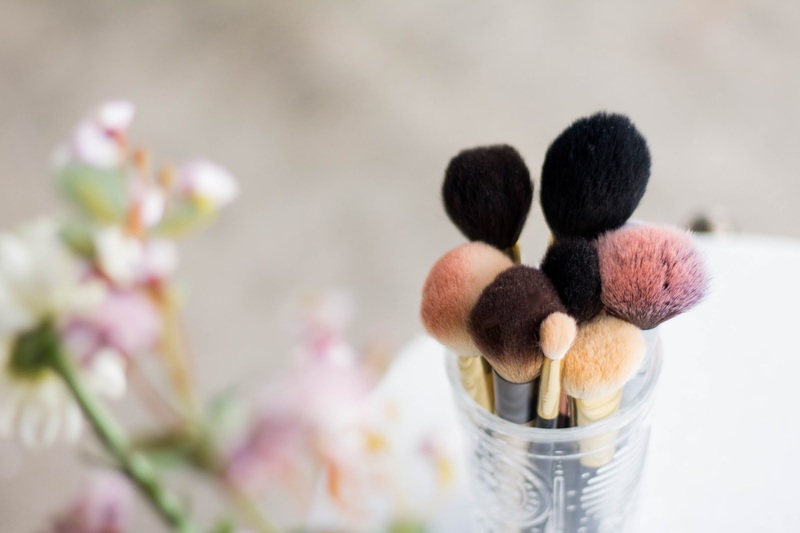 As a result, your makeup won't look cakey or crease and you won't be wasting and overusing your makeup products. 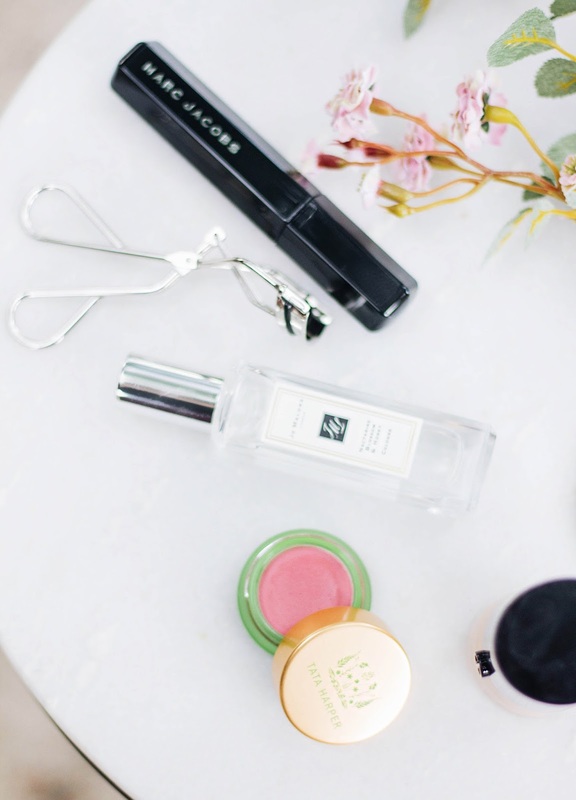 Now, these upcoming products below have been so great as serving double duty, keeping my makeup routine to a minimum. I love them so much that they'll be front and center for the next few months. 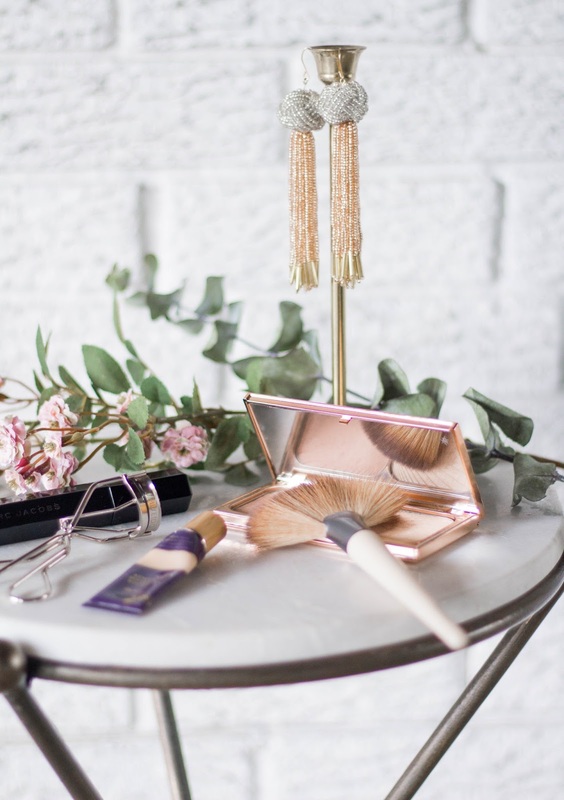 Charlotte Tilbury Filmstar Bronze & Glow: This bronzer has been my go-to every Summer. 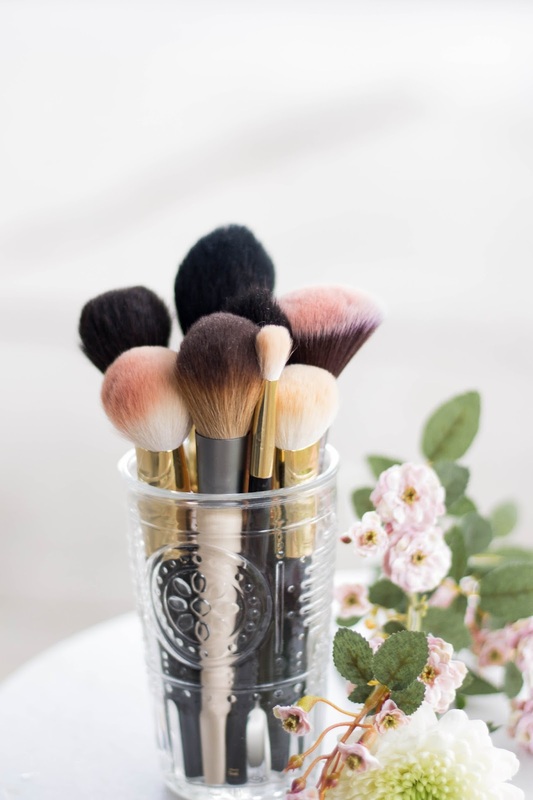 It give's you that sun-kissed look, while contouring at the same time and I enjoy applying it with this Hakuhodo brush. I alternate between a few bronzers, but this is one I turn to the most often. Lately, I've also been adding this bronzer in the crease of my eyes as a wash of color, after applying a cream eyeshadow that I will tell you about in just a second! Sheisedo Shimmering Cream Eyeshadow in PK224 Mousseline: I've raved about this a few months ago HERE and I'm still loving it so much! It acts as a gorgeous light shimmery base before applying your eyeshadow and doubles up as a cream highlighter for your cheekbones. The sales associate at Shiseido showed me this technique and I've been loving this ever since. When applied to the cheekbones, it translates as a light pink pearl shimmer that gives you an amazing glow when your face catches the light. It's perfect for everyday, but if you want to amp it up even more for date nights, just lightly dust your favorite powder highlight on top and you'll have a gorgeous highlighter combination. 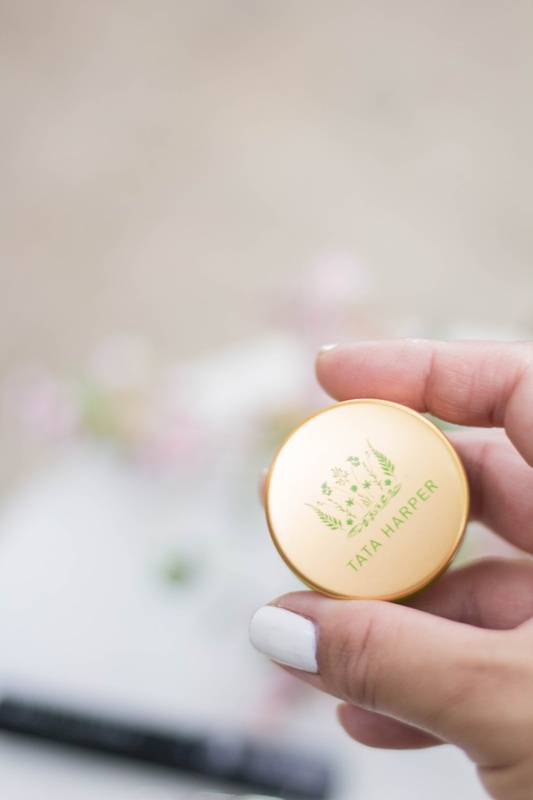 Tata Harper Lip and Cheek Tint: This lip and cheek tint has been the prettiest addition to my Summer make up look and is the final step in my routine. I simply use my finger tips to apply this to my cheeks & lips and I'm left with a beautiful flush to my cheeks and soft kissable lips that I very much love! I have this in Very Charming, which is a watermelon pink shade, but Very Naughty is next on my list! 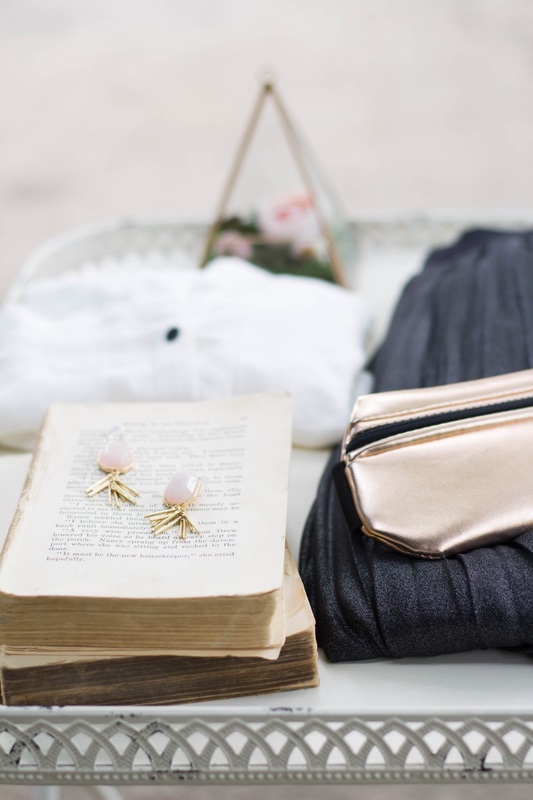 It's officially Summer and I'm ready to jump right into the season with my favorite bags of the season! 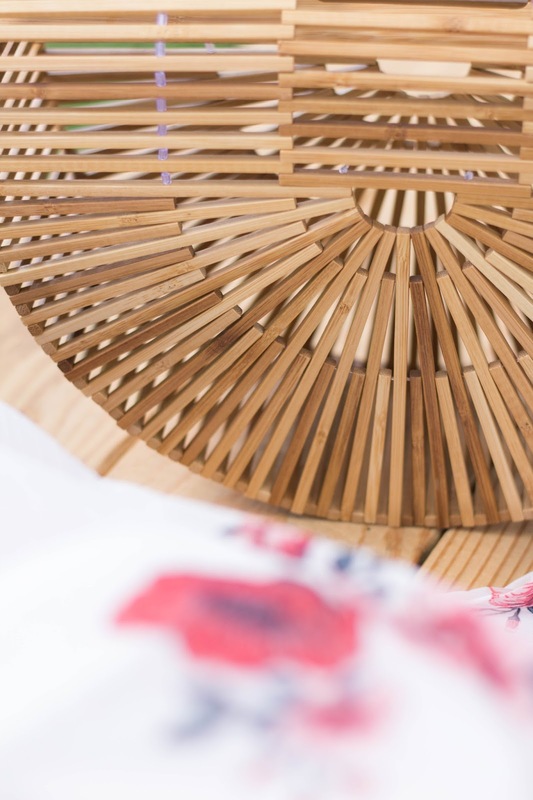 From straw to rattan, I'm all about this fun summer essential that's perfect for everyday, poolside or at the beach. 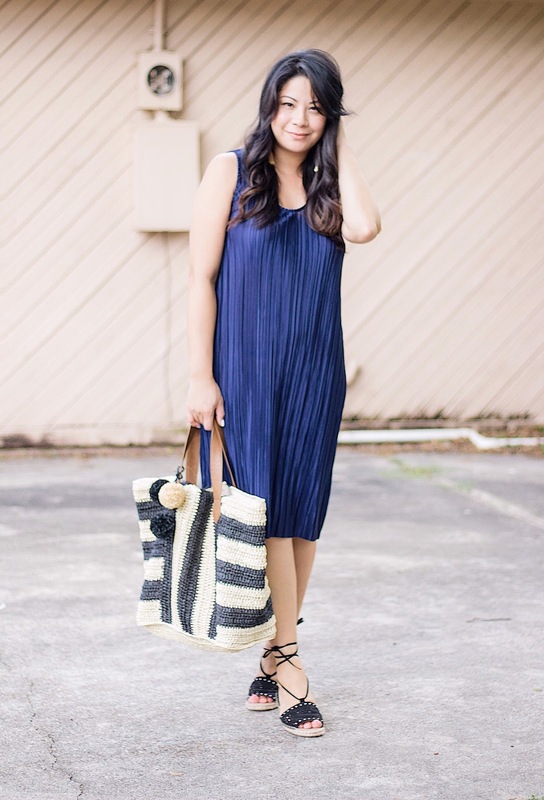 What I love most about these summer bags is the organic look and texture they add to any outfit. It screams Summer and I want to embrace this season that I love so much! 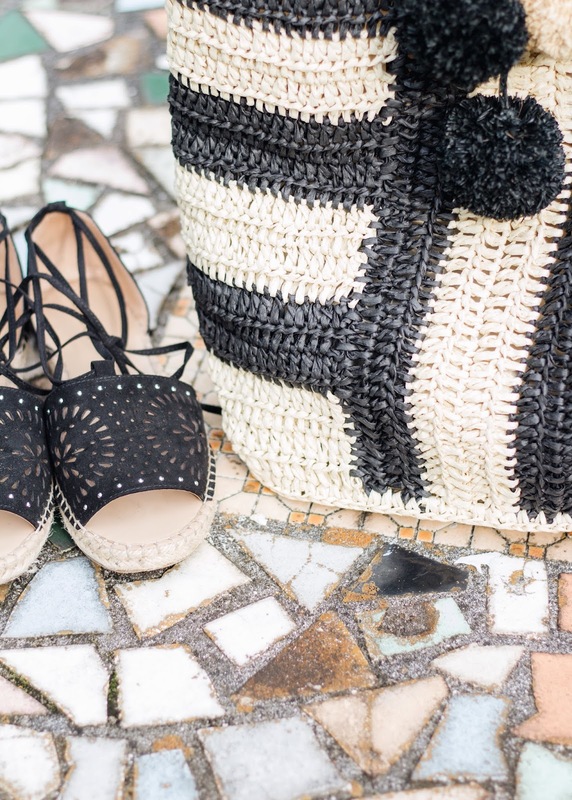 Way back when, woven bags were your go to beach bag, but they have evolved into so many cute styles that make it hard to resist falling in love with them. Luckily enough, these bags are kinder on the wallet and you can find a version from your favorite brands for under $70. I've been very much into pops of black this past month and I love the element of sophistication it adds to my soft and flowy summer looks. Even with this navy dress from H&M, which can double up as a cover-up, looks magnificent together. 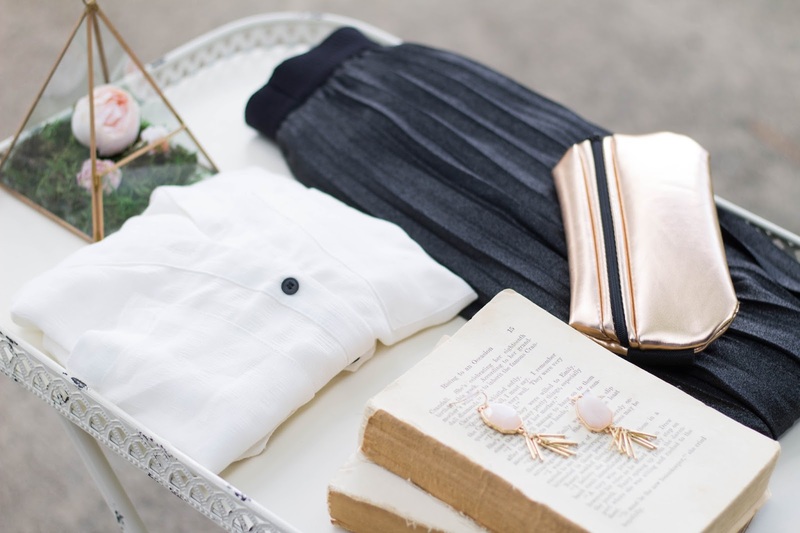 It's nice to have a stand out color in your Summer wardrobe (whether it's black, red or green), among the whites and beige's we normally wear this time of year. 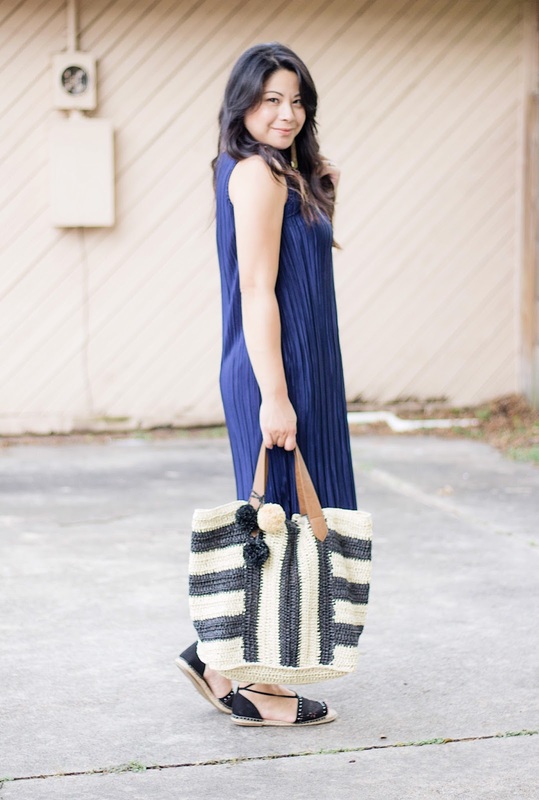 Below are some summer bags in different styles that I'm obsessing over, including this new striped bag that I recently picked up last month from Nordstrom Rack! 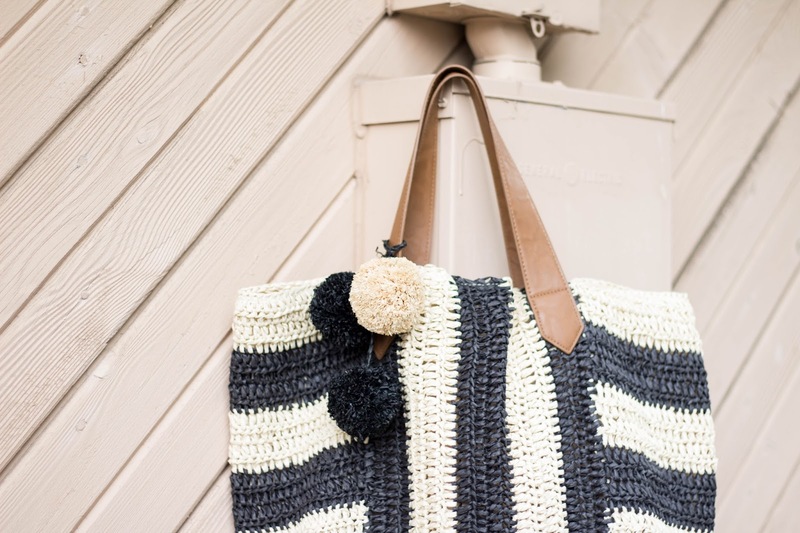 The stripes and pom-pom detail are so fun and I love displaying this in my hallway as a reminder of the Summer season. I hope you pick up one of these pretties for yourself and happy shopping loves! Travel season is upon us and potential vacation spots have been running through my mind nonstop. Ever since moving to Texas years ago, the summers have been reserved for California with my side of the family. It's really the only time we get to spend together, with the exception of Christmas sometimes, and the kids really look forward to it. This year however, we wanted to switch things up and do something a little different and more low key. Relaxing, but affordable getaways is what I'm more interested in this year, perhaps a beach house stay or a trip not too far away, like New Orleans to enjoy the amazing food and historical attractions. My little sister just moved to Las Vegas and I'd also love to visit her if I can manage to score some decently priced tickets. I'm telling you, plane tickets for a family of 4 add up so quickly. Since it's high peak season for travel, you can expect to see tickets ranging from the mid $200's to nearly $600 for domestic travel alone. Insane, I know! No matter the destination, I'll be turning to a few essentials that'll be a huge help during the mini trips we take this Summer. One of them being this rose gold waist band that I absolutely adore! 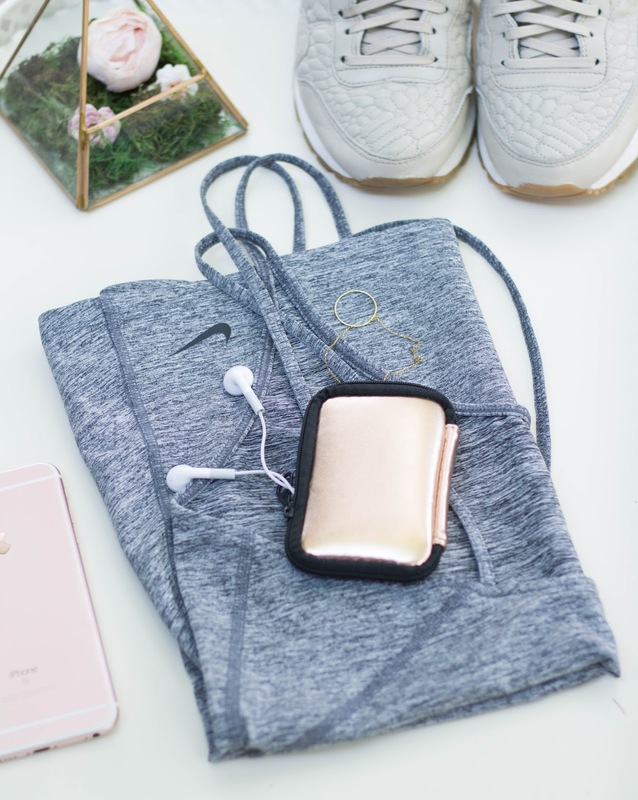 Initially meant for hold my belongings at the gym, I've been loving this waist band, bum bag, modern fanny pack (what have you), for so much more! 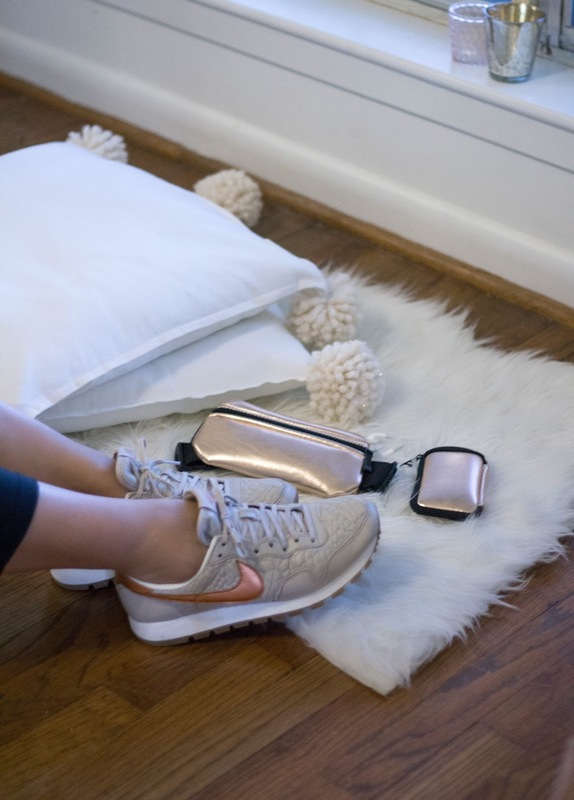 It's incredibly comfy and the metallic rose gold makes it so stylish and cute to wear. 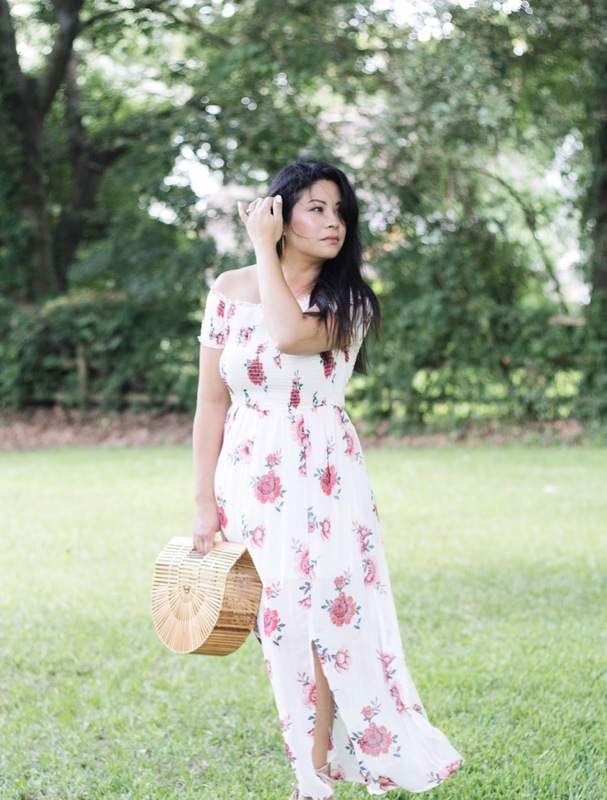 I've worn it to amusement parks and the farmer's market and it was seriously the best! I didn't miss my crossbody bag one bit when I wore this! And I get compliments too, every time I wear it! They just love the convenience of this bag and this modern take on a retro classic. A brilliant style in my option. I can fit my iPhone 6S, credit cards, keys, and cash, without it looking bulky and the straps are easily adjustable. 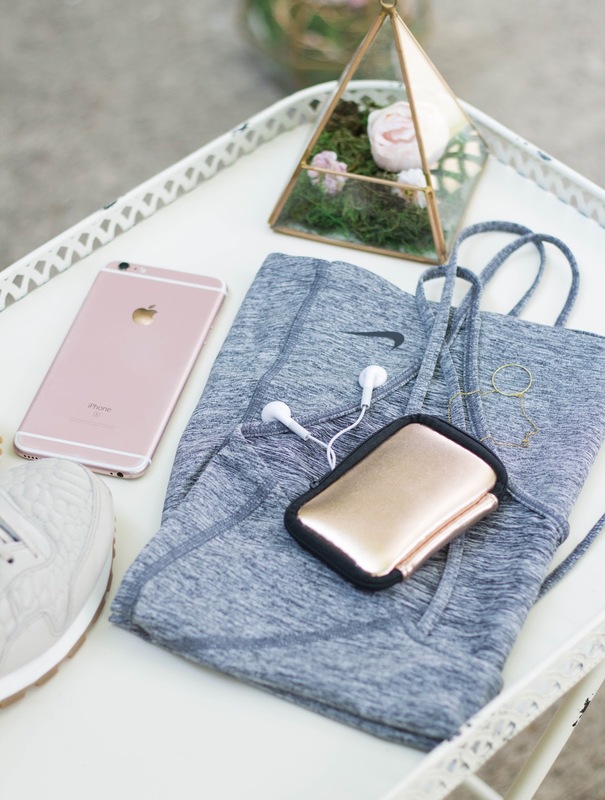 I also have the matching earbud case that's perfect for the gym and for travel. I don't know how many times I lost or got my earphones tangled in my tote. This case has made things so much easier for me and the little investment of $10 was well worth it to help keep me organized. I've even stowed my earrings and necklace in this case before working out. It's definitely a cute compliment to my waist band and is very much needed. 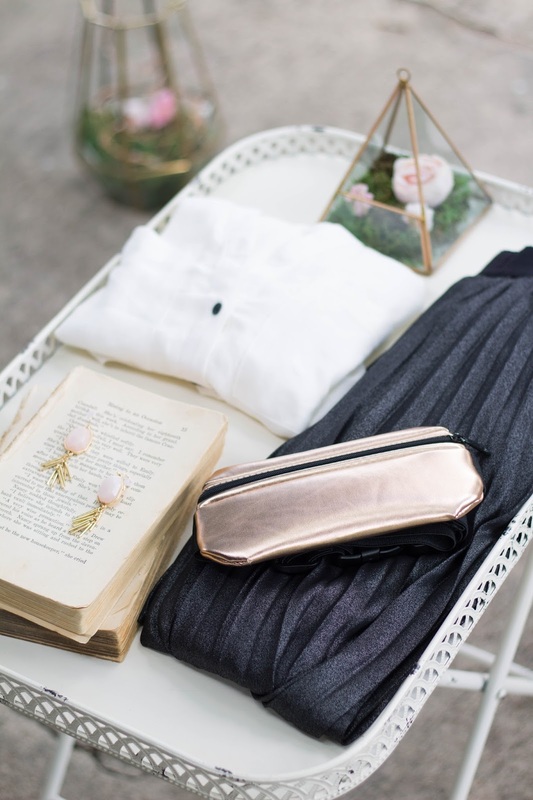 I will surely be leaning on these essentials during our summer outings and travels, whenever they may be. Hopefully, a couple of destinations will be booked soon for travel in July and I simply can't wait! Where will you be heading off to this summer?! Happy June dear friends! Summer is upon us and life is starting to settle down from the hustle and bustle of the kids ending another school year. Life was really on the go for the last few weeks and I wanted to chat about all that's been going on lately, along with sharing some current favorites. I've come to realize that June started off as a time for rest and it's something that I truly needed. Between mommyhood, planning my daughter's 7th birthday party, renovations going on with the house, and the school year coming to an end, my body started slowly down on it's own. There really wasn't much I could do about it. I wasn't feeling too well, likely because of stress, and I needed to just take a long breather to bring me back to calm. It was so nice to have the kiddos home with me again during the day and I used these past two weeks to spend some quality time with them. I also started designing and creating more, which I feel is my calling in life. I love planning events and turning them into something beautiful and unique. I was in my element again and was really taking some time to enjoy these simple pleasures in life. If someone were to ask me, "what is the one thing that keeps you inspired," I would say flowers in a heart beat. Flowers play a big part in my life because they not only constantly inspire me, but they bring positivity and joy to my soul. 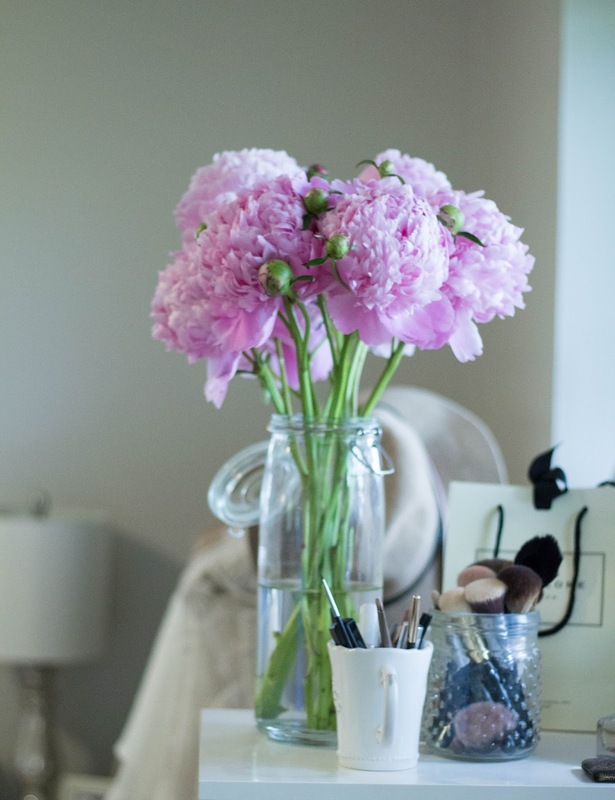 Since I needed some uplifting, I wanted to shower my home with one of my favorites, which are peonies. 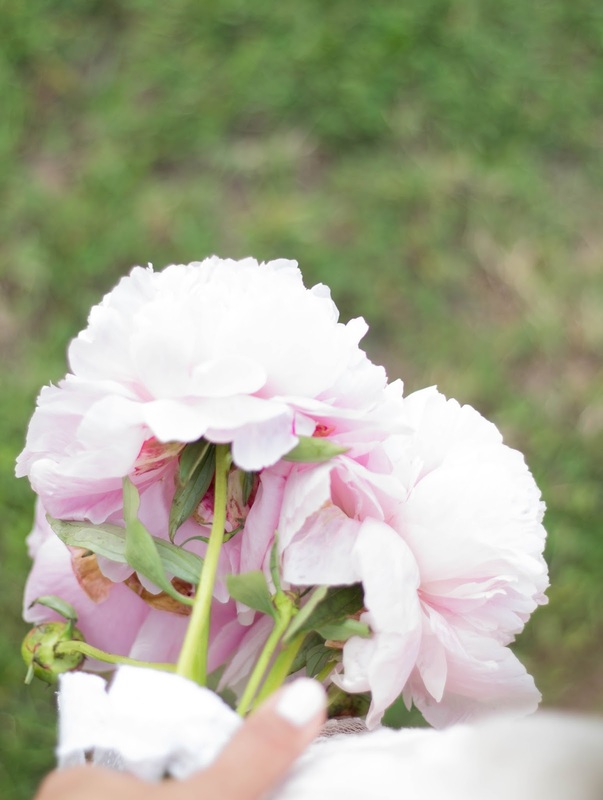 Dahlias, roses, and peonies are what make my heart sing and I hope to one day have a beautiful garden in my backyard with these blooms. 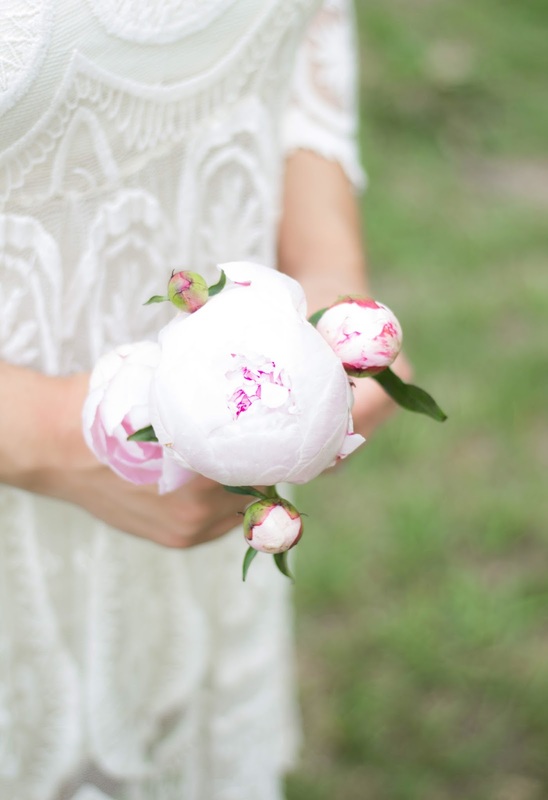 Peonies are wonderfully fragrant and fluffy, and they're a dream to decorate with. 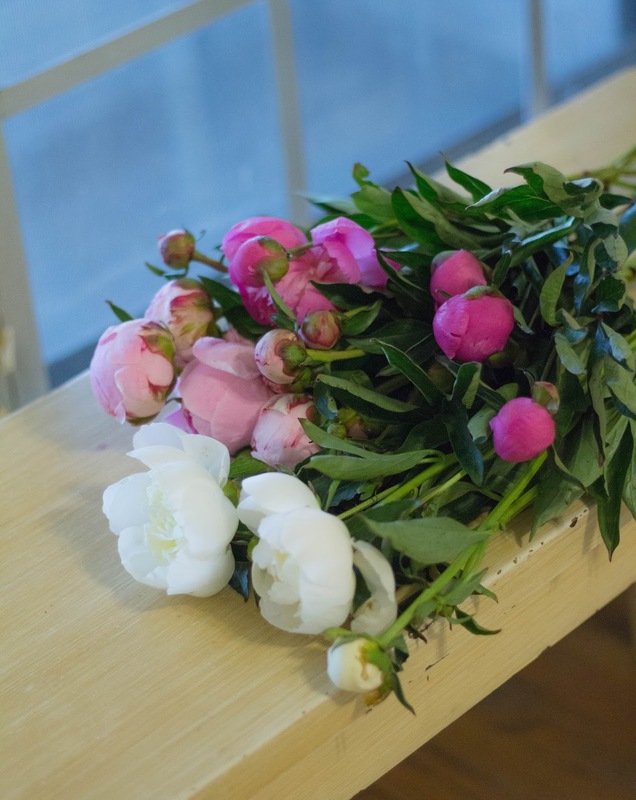 The end of Spring and early Summer is when you'll see peonies more available in your local flower shops and grocery stores, which is why I grabbed 5 pretty bunches recently to place throughout my home. I'm also a major sucker for pitchers and love using them for flowers. 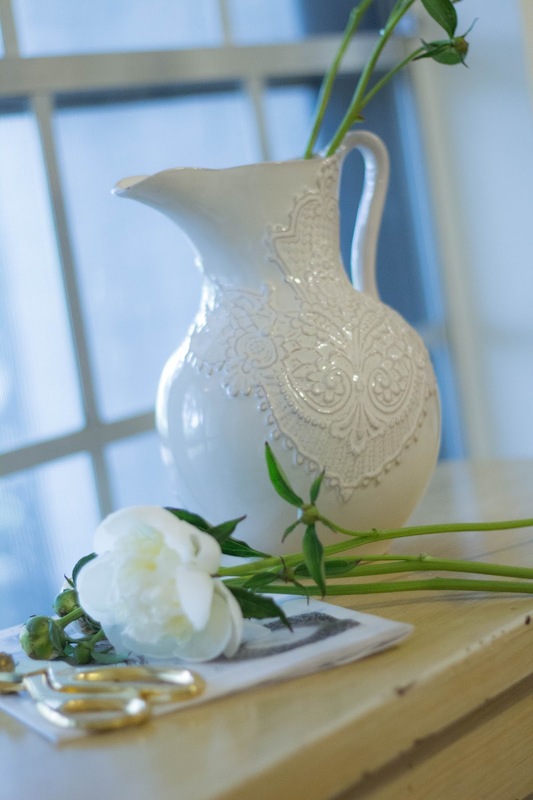 These two pitchers from Marshall's were right up my alley, from the bohemian lace design to the eclectic vibes of the blue. 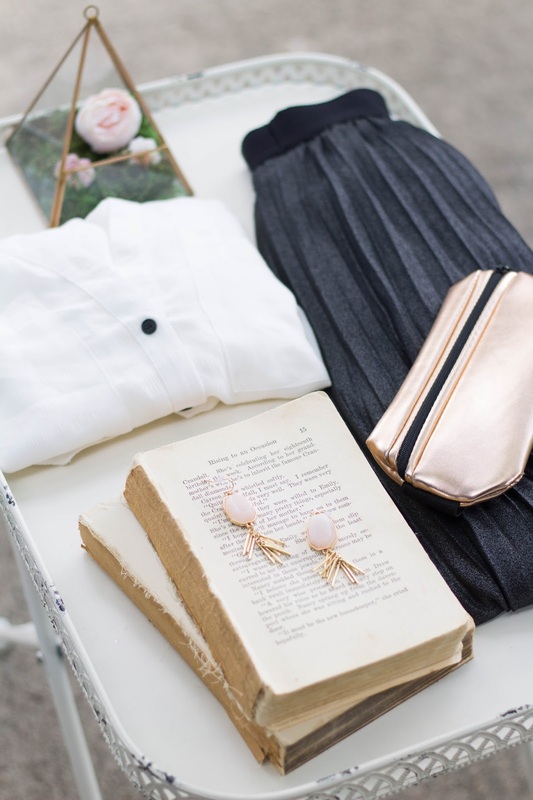 My style closely resembles an Anthropologie meets Garden point of view, so finding these beauties at such an amazing price point was absolutely perfect. 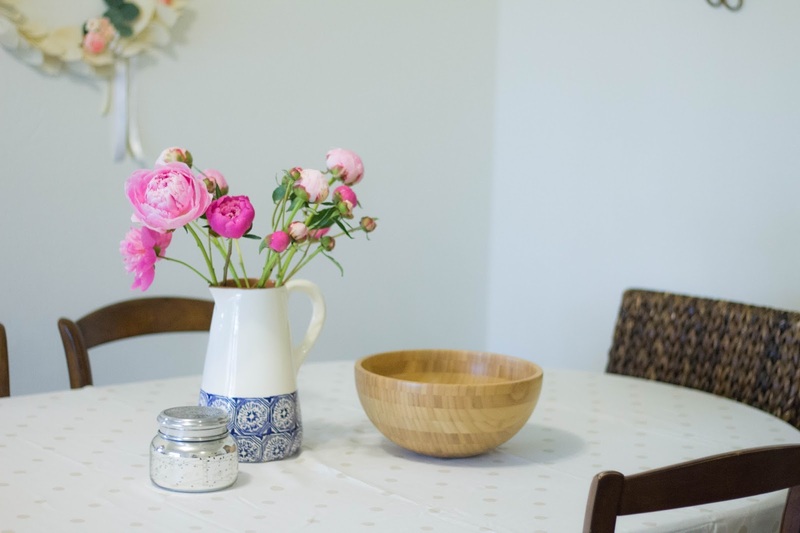 Terrain and World Market are also favorite places to find eclectic and unique home goods. Speaking of World Market, I also love their unique jewelry and practically everything there, for that matter. 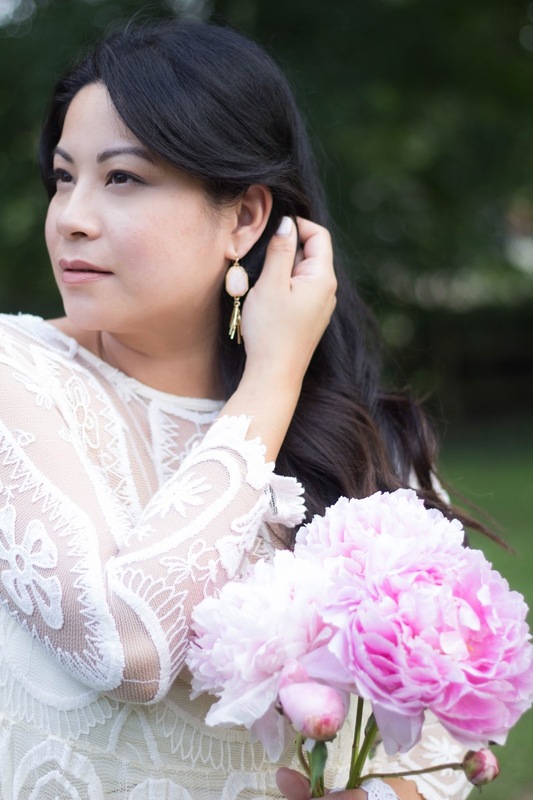 These gorgeous pink quartz earrings struck me at first glance and I've been loving them ever since. 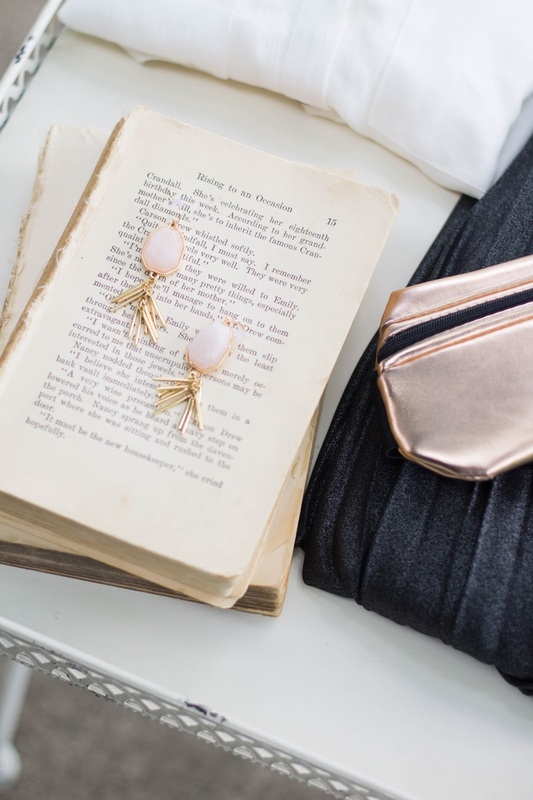 They're available in store and online for only $14.99, but here are a couple of other pretty drop earrings that I've been eyeing: here, here, and here. 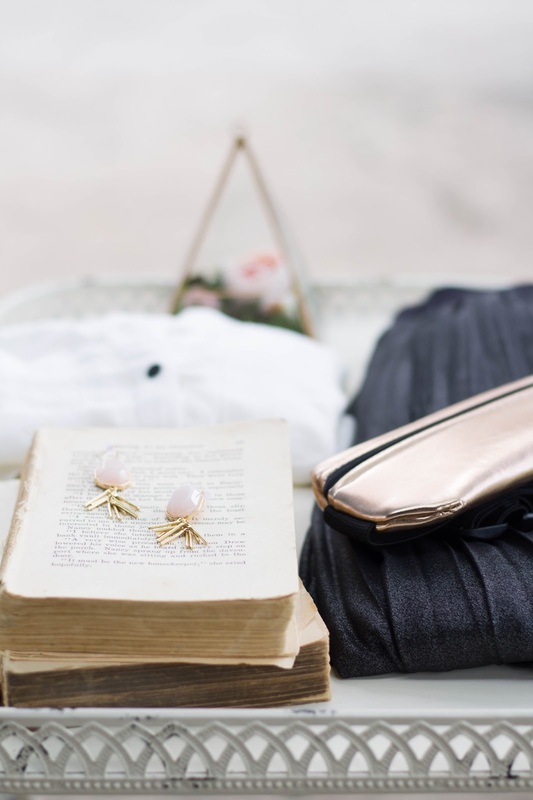 If you love the bohemian look, which is perfect for Summer, World Market is really a great place to find gorgeous jewelry and decor! 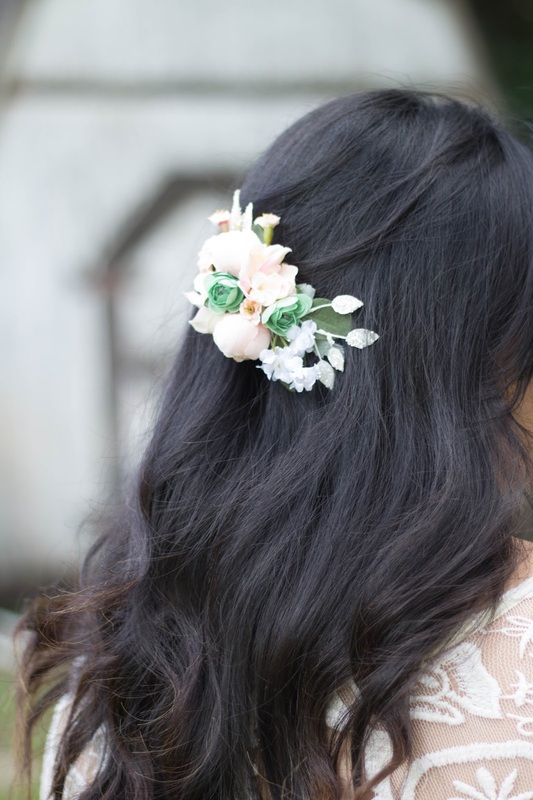 Since I've been getting more in touch with my creative side again, I've been making flower crowns and hair clips again, which I've had so much fun doing! I have a few plans I'm putting into place with my Etsy shop and hope to re-open by the end of the summer, with a new style of pretties mostly catering to weddings and special celebrations. I strongly believe that we need to take some time aside to concentrate on ourselves to recharge and get inspired once again, especially after a very busy time in our lives. And it may come during the turn of every new season. It's important to enjoy life and all the beauties around us. I hope you have a wonderful week and I'm so excited to be back! Planning a party, a successful one at that, can be quite overwhelming with lots to consider and think about. 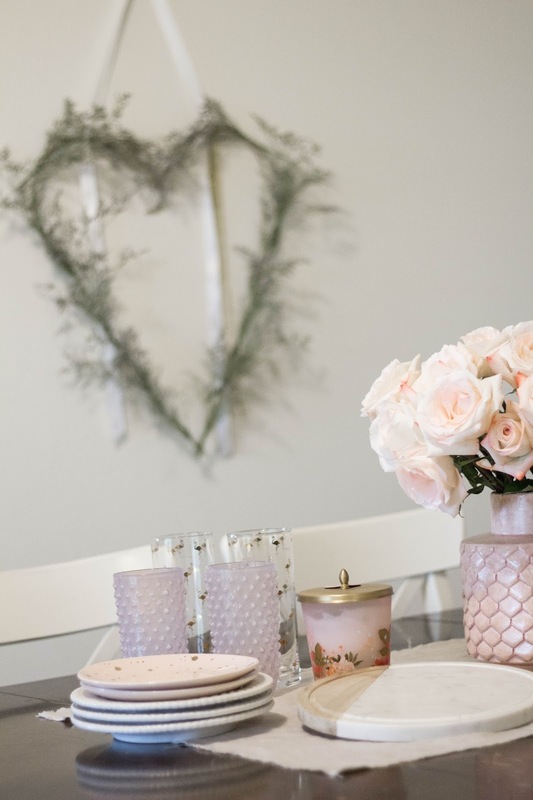 After event styling and making decor for years, I know first hand that it can be a complex process, especially when you don't know where to start and what to spend your time and money on. 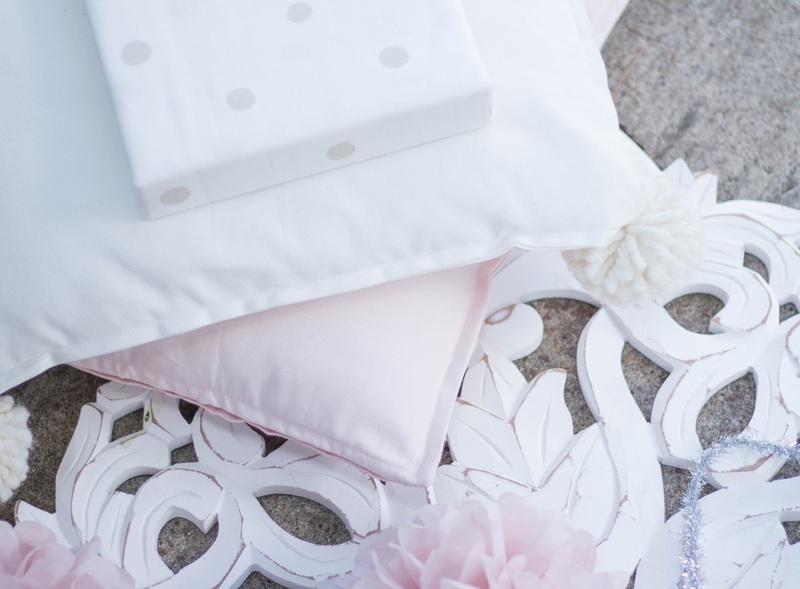 Since I'm in the midst of planning my daughter's birthday party, I thought it would be the perfect time to share some tips for planning a beautiful and successful party (no matter the celebration), while staying on a budget. 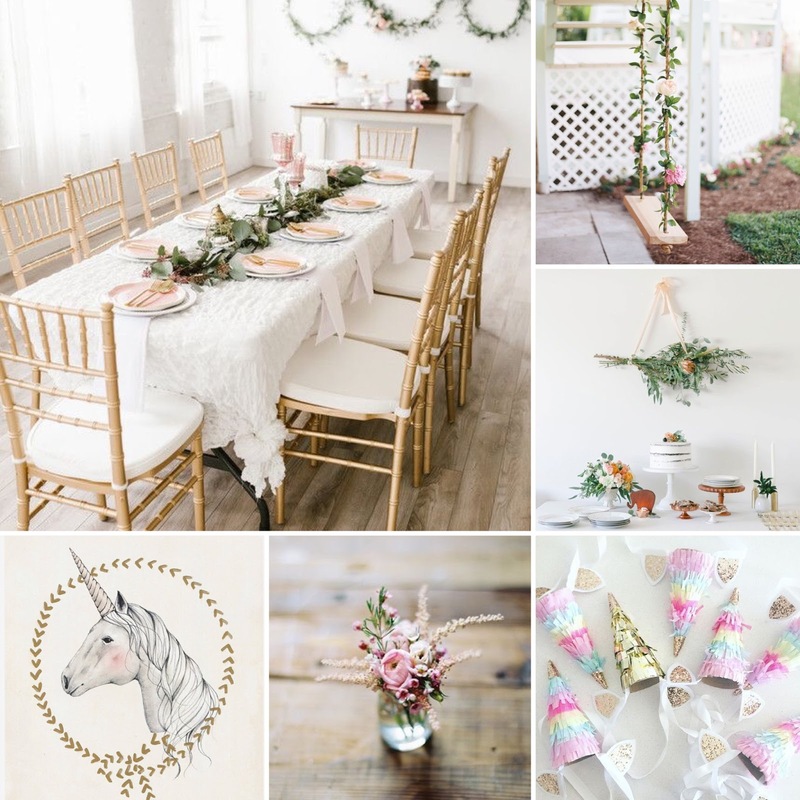 The fun part about planning a party is deciding on a theme! Whether it's a Summer Flamingo party or a Strawberry & Gingham Picnic party, this will set the basis for all your planning. 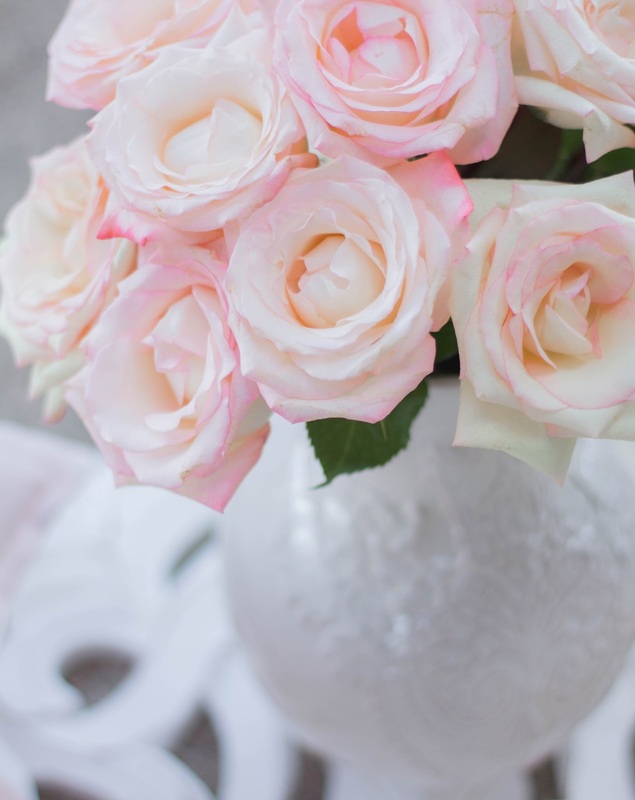 Themes can also be centered around a favorite color palette (ex. white & gold, pink & yellow), as well as with your style. 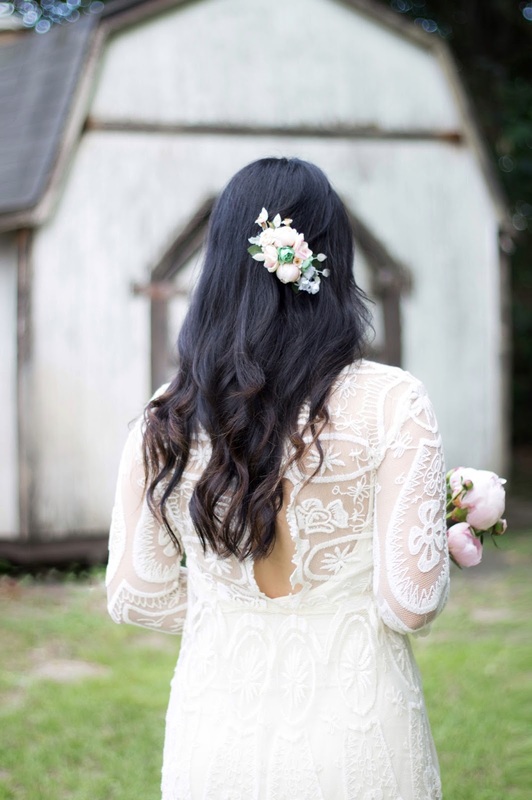 Bohemian and modern vintage styles are among my favorites. I like using Pinterest as an excellent place to gain inspiration on ideas too. 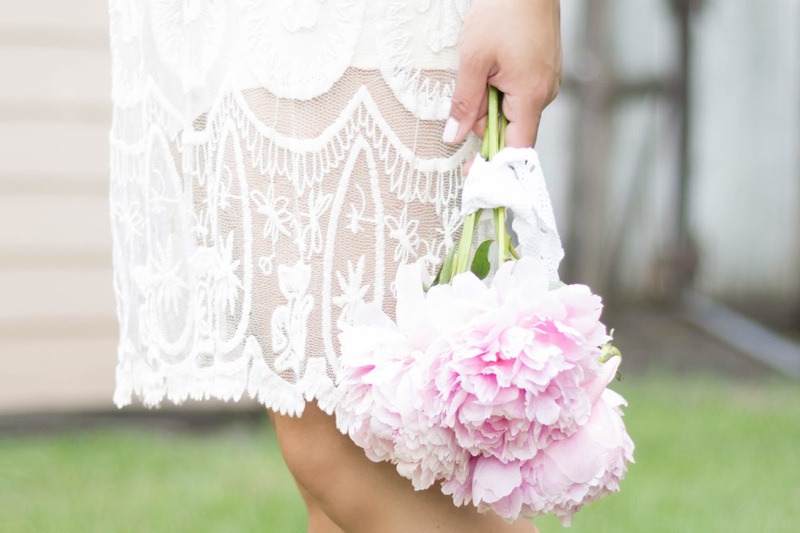 Although they may not be your exact vision because parties are unique to your personal style, they are great examples to help keep you focused during the planning process. I love making inspiration boards as a road map for parties I plan. A free mobile app I really enjoy using is called POTO, for making collages. Here's an example of a recent board I made using this app, for my daughter's upcoming Enchanted Unicorn Birthday Party. When planning a party, some people think that they need to buy everything associated with the theme. If you're hosting a Summer Flamingo party for friends, don't feel like you need to buy Flamingo everything to tie the look together. 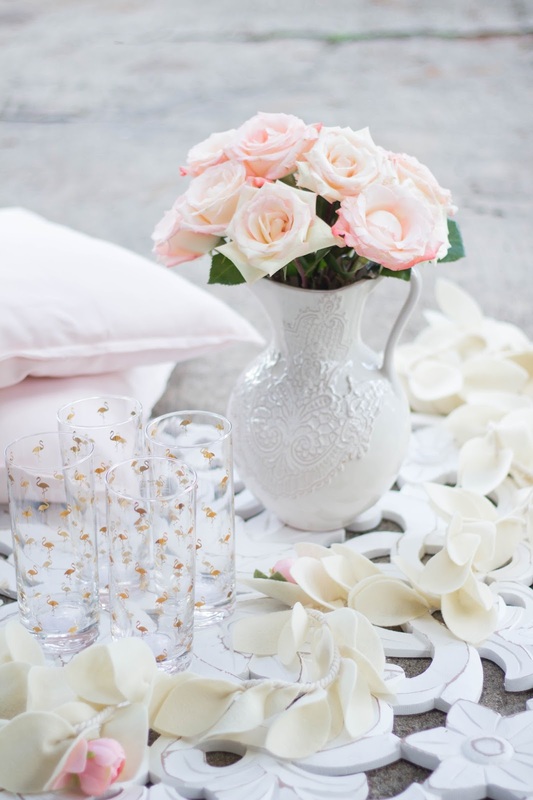 Rather, use the color palette to keep the party decor looking cohesive. When styling parties, I like to chose a few places I want to showcase the theme: in the cake, in a creative station, and on the dessert table. All the other decor can be neutral with pops of your color scheme. 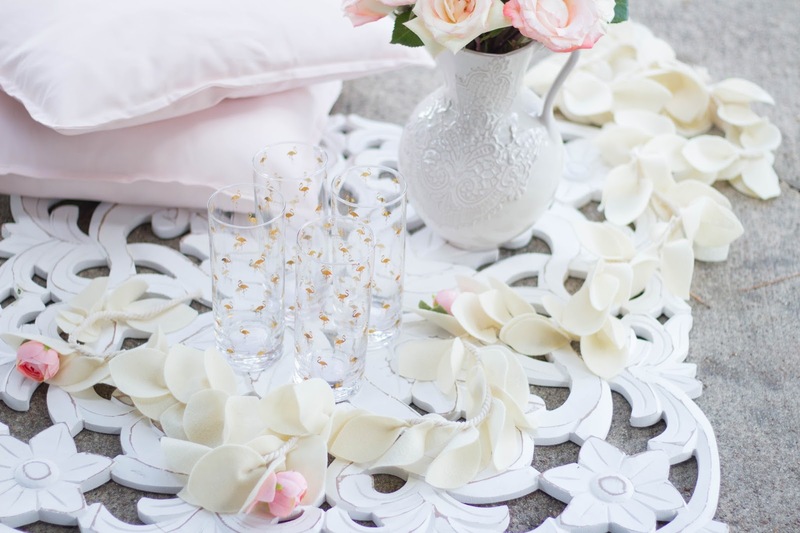 This keeps the party looking visually appealing, instead of being overwhelmed with the same kind of decor. CAKE, CUPCAKES or SWEET TREATS? 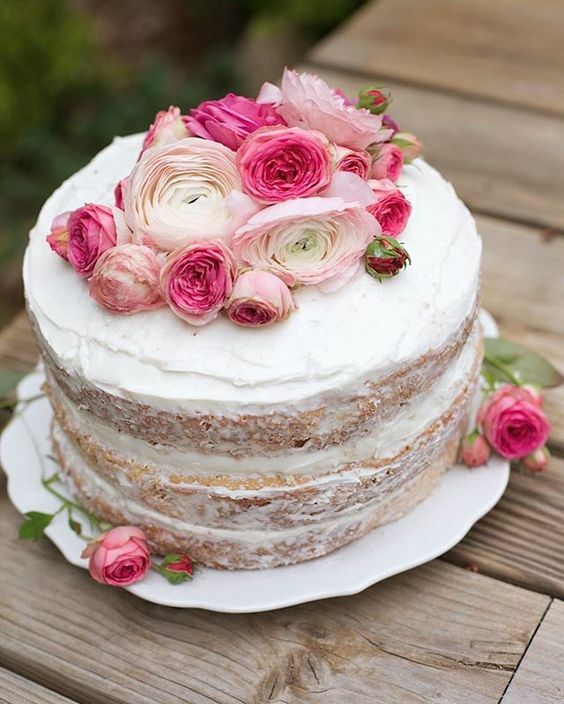 Having a cake was typically the norm when it came to birthday parties, weddings, and other special celebrations. Now-a-days, it's all up to personal preference. Cakes are a fantastic way to really showcase your theme and they can be the statement piece to your party, just as a luxury handbag is to an outfit. Cakes can be quite elaborate, but even simple cakes can be transformed into something extraordinaire! Adding height and/or layers can amp up any cakes look. Order a semi-naked tiered cake as a cost friendly option and a cake topper and cake stand to highlight a single layered cake. On the other spectrum, serving cupcakes and other sweet treats, in lieu of a cake have been popular for its convenience and uniqueness. Cupcakes are generally easier to serve with easy clean up. You can always order a small cake for the celebrant and then serve cupcakes or other sweet treats to your guests. Smaller desserts also allow you to have a variety of flavors to choose from, making it more personalized for your guests. Other popular sweet treats have been donut towers and parfaits in cute jars. Parties can be a pretty penny and the most elaborate are usually planned several months in advance. If you're on a budget (like myself), concentrate most of your funds on: Entertainment, the Dessert Table/Bar and one Statement Piece. You want your guests to remember more than just pretty plates and cups, so work on the major parts of your celebration first. For entertainment, I love setting up a station: a flower crown station or crafting station. 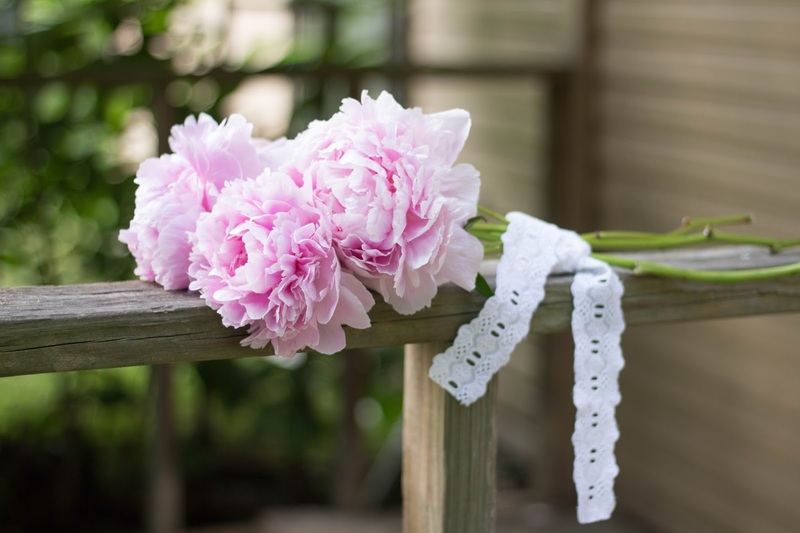 If you're hosting a bridal shower, have a veil making station for the bride. It's fun and exciting, especially if you're holding a contest for the winner. Stations are interactive and you'll be a happy camper seeing all your guests mingling with one another. If you have a station where they will be keeping their creation, it can double up as a party favor too. Now, who doesn't love that! The dessert table is the prettiest area of your party and where you gather to recognize your celebrant, sing Happy Birthday or hold a toast. It's also the perfect spot to showcase your theme. So, show off your decorating skills with amazing decor and yummy treats on beautiful serving plates. You can even choose to have a bar, such as a coffee bar or Smore's bar, for something more specific and unique. 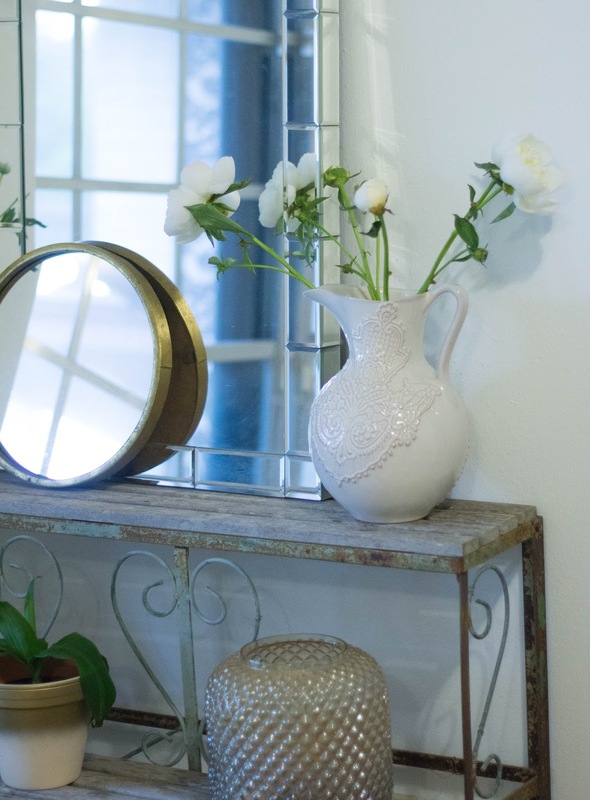 If you have room to splurge on one last thing, make it on a statement piece. 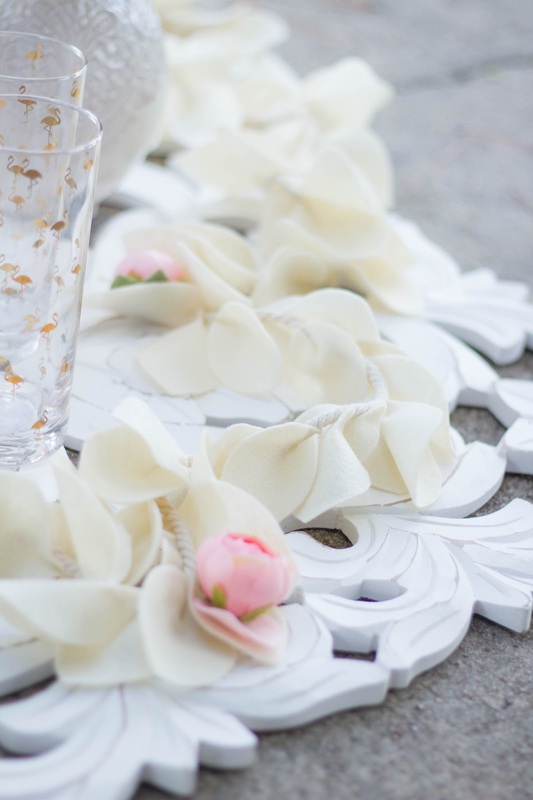 It can be on a lovely garland, a large display of balloons or even a decorated back drop for guests to use as a photo booth. The point is to choose one more main thing to focus on, which can even be on the food, if you choose.